When creating the list of things we needed for the new baby, I spent hoooours looking at all the different options for every category. It turns out that creating a registry (thank you to everyone who helped us feather our nest!!) can be very time-consuming. Of course, we all want to make the safest choices for our little ones, but how to choose?! Hopefully the things I learned in doing it can save you some time. It's delightfully affordable (I mean, come on, it's $17.99 on Amazon), and you can buy organic cotton covers that make it a little more eco-friendly. It's waterproof outer is vinyl. The Summer Infant website says the vinyl is PEVA vinyl, but there is no other information on makeup except that the core is "foam" of some kind. One would hope this means it's PVC-free, but there's no way to know. PEVA vinyl is an eco-friendlier vinyl option because it contains fewer (fewer still means some, though) VOCs than PVC, but it's made from petrochemicals (still problematic as a fossil fuel pollutant), and also contains a myriad of untested chemicals. It's Global Organic Textile Standard (GOTS) certified, meets/exceeds Greenguard emissions and formaldehyde-free standards, is made with organic cotton and food-grade polyethylene. It also claims to be free of latex, soy, GMO, vinyl/PVC, phthalates, flame retardant, and perfluorinated compounds (PFC). Woohoo! 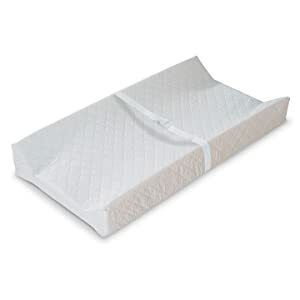 Plus, you can get the aforementioned organic changing pad covers for it. For so long I thought these were my two choices, and I was trying to decide if we needed to shell out for the organic, or if I could live with the affordable non-organic option and comfort myself that the baby doesn't spend too, too long on the table. And then my amazing friend told me about the Keekaroo Peanut Changer, and the clouds parted and angels sang. Now, the Keekaroo isn't organic cotton or anything, but it is non-toxic. The JPMA Certified changer is free of latex, PVC, BPA, phthalates, and formamide, and is easy to clean, fluid resistant, and durable. 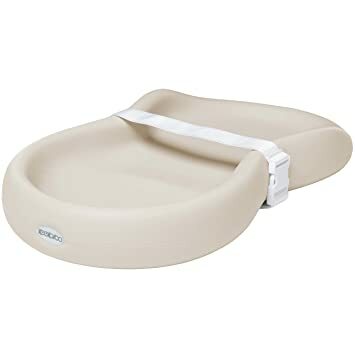 "The cushion material…is made of polyurethane polymer and foam. Polyurethane Polymer is the raw material form. Once Polyurethane Polymer is processed, it becomes a Polyurethane Polymer Elastomer, which is a synthetic rubber. An example of a Polyurethane Polymer Elastomer is Spandex, sometimes referred to as Lycra, found in all kinds of clothing material. Our Cushions do not contain PBDE…[which are] organobromine compounds that are used as flame retardants in some applications. Our Flame retardant properties come from the inherent polymer structure of our trade secret materials. We do NOT use PVC in any products we make or sell. Therefore, our products have no phthalate additives. We’ve passed all testing required in this industry: Government: CPSIA (Consumer Product Safety Improvement Act), as well as independent certifications on Safety: JPMA (Juvenile Products Manufacturer association), ASTM International (American Society of Testing Materials). Our cushions are proudly made in the USA. The skin of the cushion is a proprietary process that creates a non-toxic, seamless product impermeable to fluids and offers anti-microbial protection. Due to this proprietary process, although details are kept internally, I can tell you that the antimicrobial protection is a citrus based compound. Tested in the harsh hospital and school markets, our cushions are proven peel, tear and puncture resistant and include a slip resistant texture to ensure safety." I need to add to her response that the Environmental Working Group gives polyurethane a 1, the best/healthiest score. While I originally wrote off the Keekaroo because it's not the usual organic fare, I am beyond delighted that I jumped that hurdle. Why you ask? Two words: No laundry. Okay, five: No laundry, and no dampness. That's right, folks, the magical Keekaroo just wipes down. That's it. I didn't realize how much of a gift this item was until we brought our little one home and for the first couple weeks she had a Pavlovian response to the changing table and peed every time we took her diaper off. Every time. I couldn't imagine having to change the pad cover or rig up some other fluid absorbing contraption (lots of people put cloth diapers down, which is a great option) every time we changed her. That and it feels super sanitary because it's non-porous and can be easily wiped down with whatever we want when a little miss someone poops on it (explosive, successive poops? Check! ), blows out her diaper, spits up (also a common changing table past-time), or any other miscellaneous bodily fluids issue. Something important to point out is that the surface dries pretty instantly. Here in the Seattle area where it's wet a lot of the time, things don't dry out so easily, so there's potential for pads without a strong water-resistant outer lining to become a breeding ground for mold or bacteria. So those are the pros. For the cons, the big one is price. The Keekaroo is $125.75 (that's $4 cheaper than on their website, exciting stuff) on Amazon. Yikes. This is a hefty price tag, for sure. BUT it lasts forever (if you have plans for multiple kids this is a super benefit), doesn't require extras, and won't contribute to your electric or water bills with all that extra laundry. What is this "Extras?" If you go with the Summer Infant or the Naturepedic, you need extras. Let's say you buy waterproof bamboo liners for your regular pad, $21.27, and two organic covers so you can alternate while one is in the wash, $16.95 each – that's $55 total! (But, hey, a clean & dry pad is priceless.) So if you see the prices of options 1 and 2 with an extra $55, the the price discrepancy is less painful. Still, the Keekaroo isn't your typical non-toxic option. It's not made from organic cotton, hemp, or bamboo, but it is made without toxic ingredients, and I can say that there was zero odor on unpacking (which makes me hope the non-toxic claim is true). When it comes down to it, this product makes our lives so much easier. I genuinely love it, and so does our babe! Our little lady LOVES her Keekaroo. Oh my goodness, she is just happy as a clam on this thing. As far as I'm concerned, it is money well spent.